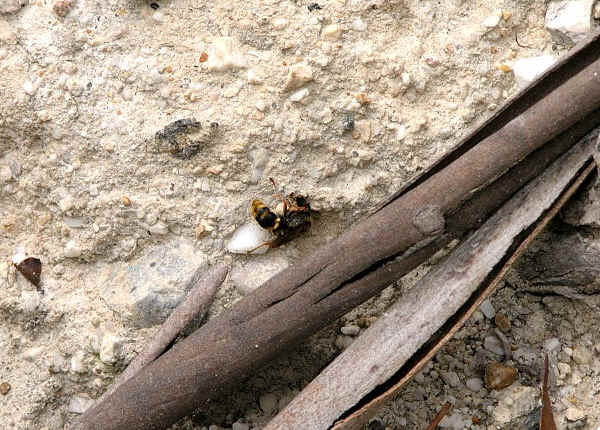 This page contains pictures and information about Sand Wasps in subfamily Bembicinae (previously Nyssoninae) that we found in the Brisbane area, Queensland, Australia. 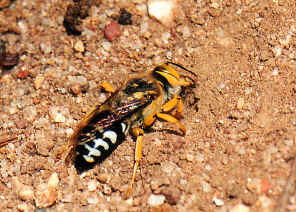 Sand Wasps in this subfamily Bembicinae are medium to large in size, with stout body and at least with one colour of orange, yellow or brown. 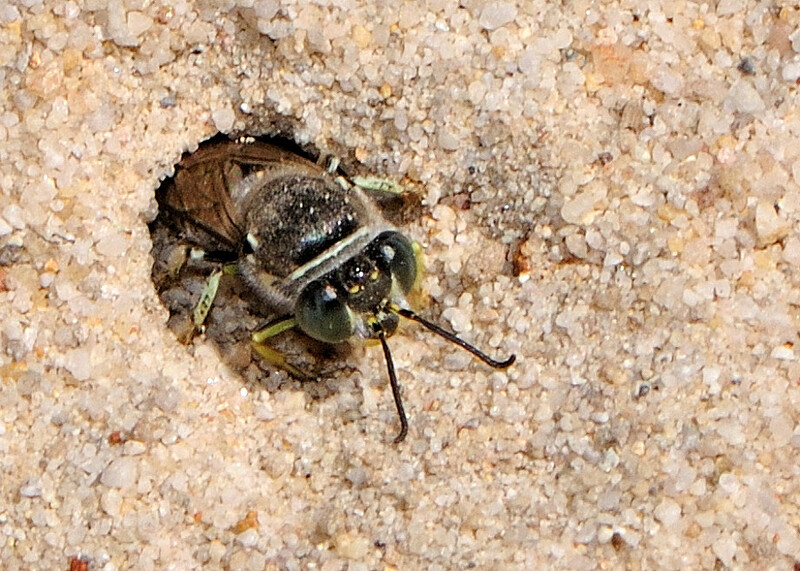 Sand wasps are solitary hunting wasps. They are ground nesters. Females dig long barrow in sandy ground as nest for the young. They provision their nest with different insect prey, mostly flies. 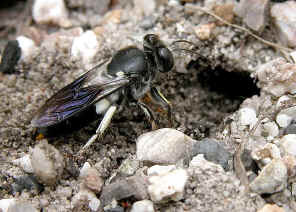 Males dig shorter burrow as sleeping chamber. Sand Wasp adults feed on nectar on flowers. Bembix is the only genus in Bembicini. 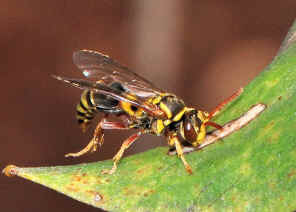 Bembix wasps are quite common in Brisbane bushlands. In mid summer on sandy footpaths, we might see them flying rapidly near the ground, defending their territory and digging burrows. They mostly provision their nest with flies. They can be recognized by the reduced ocelli and the large exposed labrum. We saw this Digger wasp flying and hovering on a sandy foot path. 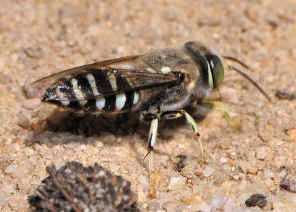 Digger Wasps are also known as Sand wasps. 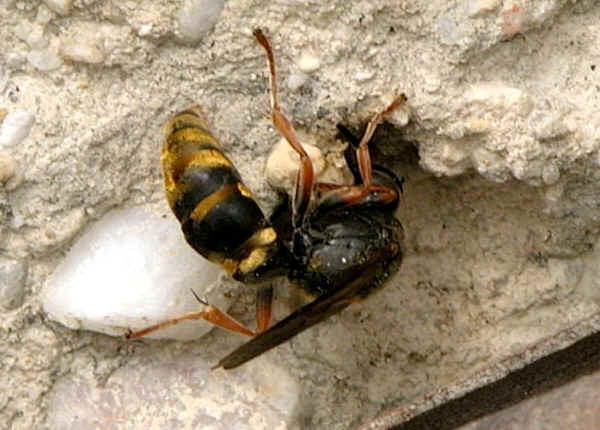 Female Digger Wasp constructs burrow under the ground, drags their paralyzed prey in and lay an egg in the burrow. Adult Digger Wasp feed on nectar. More information and pictures can be found in this page. This is the smallest Bembix Sand Wasp that we found. The wasp is black and white in colours, its abdomen is black and white striped. Its face and front legs are pale yellow. We found a few of those wasp nests on the footpath in the Reserved Area near Tingalpa Reservoir. Please check this page form more pictures and information. 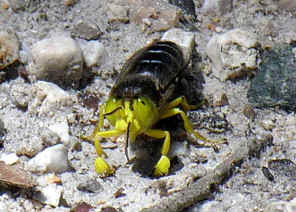 When we first found this wasp, we thought it as the Colletid Bee which also burrow nest in ground. On summer 2007, we found that they feed their young with flies (Diptera), so definitely they are not bees (all bees feed their young with pollen). 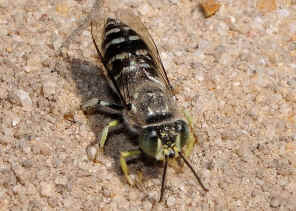 Then we check that they could be Sand wasp. 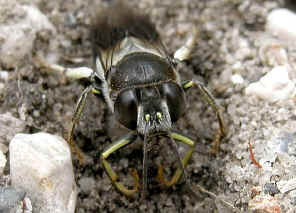 Only Sand Wasp genus Bembix feed their young with flies. We had then observed this wasp for quite a while and have a lot of information and pictures. Details please check this page. Pictures taken in Daisy Hill near Buhot Creek on Dec 2008. 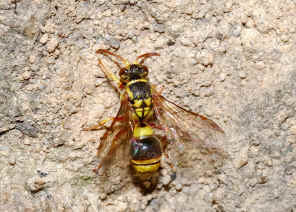 The wasp was examining the mud wall, could be trying to collect some mud. We also found this wasp on Dec 2009 in Anstead Forest. Please check this page for more information. A wasp was checking a cavity and seemed found something. We came closely and took the above pictures, then it flied away. We checked the cavity and did not find anything interesting. It might just collecting the soil. Notice the long and strong legs of this wasp. 1. Exeirus lateritius Shuckard - Australian Insect Common Names, CSIRO 2005. 2. Insects of Australia, CSIRO, Division of Entomology, Melbourne University Press, 2nd Edition 1991, p991, plate5Q. 1. Insects of Australia, CSIRO, Division of Entomology, Melbourne University Press, 2nd Edition 1991, pp 989. 2. Insects of Australia and New Zealand - R. J. Tillyard, Angus & Robertson, Ltd, Sydney, 1926, p299. 3. Bembix Fabricius, 1775 - Australian Biological Resources Study, Department of the Environment, Water, Heritage and the Arts. 5. THE SAND WASPS OF AUSTRALIA - by Howard E. Evans and Robert W. Matthews, 1975 SCIENTIFIC AMERICAN, INC.
6. The Sand Wasps: Natural History and Behavior - Howard E. Evans and Kevin M. O'Neill, Foreword by Mary Alice Evans, Harvard University Press; 1 edition 2007. Last updated: July 14, 2012.